Glory to our God, who created a people of his own! Praise to him who is our God, and we are his! Exalt the Almighty who of many made one! Worship him who did what everyone wants, but no one is able to produce, a classless society! Glory to the Father who brought us into being as his family, all children beloved and cherished! THINK: Remember David before Goliath. The world seems large, but God is greater. PRAY: God who inspires faith, thank you for the victory over the world. I believe! Strengthen my faith. ACT: Show the victory of faith by turning problems into opportunity to show the glory of God. 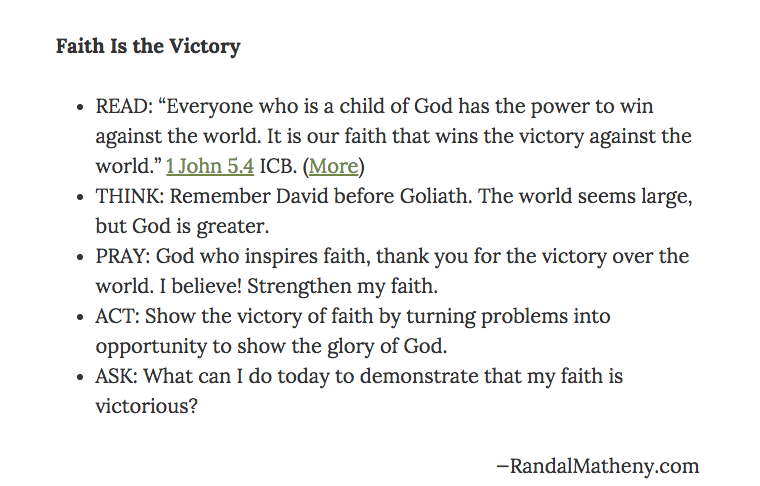 ASK: What can I do today to demonstrate that my faith is victorious? Share your experience in the comments area below. Glory to God whose Name is our monument, whose life is our breath, whose majesty defies our understanding! Glory to him who was and is and ever will be! Glory to the Lord for all his gifts of life, joy, peace, love, and, above all, himself! Glory to God who shows himself to be the Lord and Lover of man! To God be glory forever and ever, world without end, beyond the collapse of the universe, above all powers and authorities and spiritual beings, higher than the heavens that man can penetrate, wider than the most expansive galaxy — to God be glory in every heart, on every tongue, in every act! May God be proven right in all his ways, faithful in all his promises, holy in all his dealings with man. Glory to God who gives us constant reason to exalt his Name! Glory to him who still moves in this world and never absents himself from advancing his purpose! Glory to the Lord whose majesty ever enthralls and calls us to involve ourselves in himself! Glory to the Almighty who fills our eyes by renewing mercies each morning that we rise! Glory to God, who wants to be our Father, for giving us family, for creating in us his very character, for making Jesus our elder brother! Praise him for love and home and hope and security!